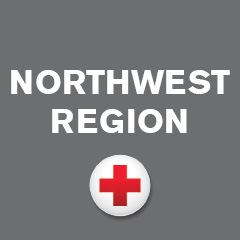 When a large fire erupted New Year’s Eve at an Everett apartment complex, Red Cross volunteers responded immediately. Despite the holiday, disaster action team (DAT) volunteers mobilized on scene. In short time, an emergency shelter was established at a church across the street, providing a warm place to stay and ensuring displaced families were safe. Together, volunteer and residents ushered in the New Year. Without a doubt, it was a rough start to 2016. Five days after the fire, I went to the shelter – the first shelter I’d ever seen – to talk to the families and help share their stories. I was welcomed to the shelter by volunteers helping at a registration table. Elementary school children were lined up for a van to school, concerned mostly by the fact their winter break was over. The van driver took attendance and the children marched off to class with high-fives from volunteers. What was previously a multipurpose room in the church was starting to resemble a home. Toddlers in footy pajamas played on cots decorated with quilts . A group of young children molded play dough and pushed big plastic trucks in the kids’ corner. Some volunteers were already preparing taco salads for lunch while others swept the floors and returned stray Legos to the play area. Neighbors sat gathered around round tables watching their young kids play and talking. Four women offered to share their stories. The first woman sat with her morning coffee and offered to share first, because she said that sharing her story helped her feel better. She had been preparing food for her family and visiting company for New Year’s Eve when the fire broke out. She helped all of the children out of the second story window before escaping herself. She didn’t do so without injury – she sustained burns, and her husband suffered a fracture from the jump. A neighbor shared her story of helping catch the children as they came down from the second story, while her husband knocked on doors to alert everyone to the fire. He found a ladder and used it to help people escape. They lost their homes, money and possessions, but one thing was unanimous amongst the women: the problems they worried about before the fire seemed much less important. While they were sharing their stories, a man came in with new sticks of deodorant and toothpaste. The table erupted with laughter and chatter as they picked items to replace what had burned. After giving their emotional accounts, the women all expressed their gratitude toward the strangers who had been working around the clock to help them. The church donated space and resources; restaurants donated food; Hand in Hand, a youth-focused Everett based nonprofit, donated time, resources and services; Red Cross volunteers came from towns away to help house, feed and provide ongoing support for the families. Recovering from a disaster can be an emotionally draining and complicated process. Caseworkers meet one-on-one with people to create recovery plans, navigate paperwork and locate help from other agencies. The shelter remains open and caseworkers are providing ongoing support for each family to assist them in their transition.